In this blog you will find entries about my painting studio business, my personal paintings and all sorts or art related and not so art related things. Got my raptor cup in the mail today from @mondonews it’s going to hang out with my Gremlins cup. Ahhh they look so cool!!! Top hand is painted using transparent watercolors only. Bottom hand has been lighted with Titanium White. I was pleasantly surprised by this exercise! I expected that by incorporating white watercolor into a painting that it would result in chalky, muddy or grody colors. In reality the paint did change the look of my painting and feel of the medium, but it wasn't actually a bad thing. So here's what I did. 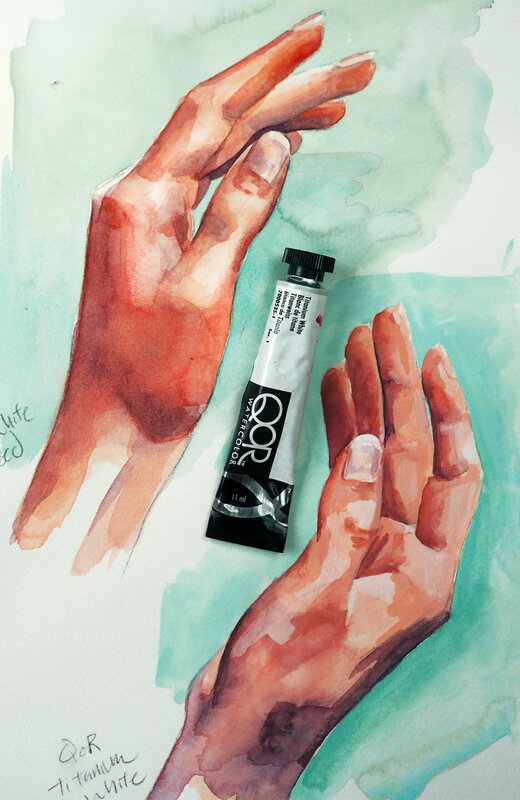 I painted a pair of hands using watercolors, lightening the values of one with water and the other using Titanium White. As you can probably see in the picture the difference in the two hands isn't some earth shattering OMG-I-can't-believe-it difference. Obviously the top hand has that transparent look that watercolor is known for. But I think the bottom hand still looks nice. I'll break down the use of white watercolor for you. less of those cool watercolor textures like granulation, blooms, etc. So here's what I've taken away from this exercise. Incorporating white watercolor is fun for my sketchbook. In my artwork I wouldn't want to lose the luminosity and texture I can get from layering transparent watercolor and I didn't care for the feel of mixing the white or the thickness thats required to get those more opaque layers. Like with all things art you'd just have to try it for yourself and I think playing around with adding Titanium White to your palette is worth investing a couple bucks in.